A guerrilla bike lane project by the Reasonably Polite Seattleites. Photo via Seattle Bike Blog. As goes Memphis, so goes Seattle. Just as a guerrilla-painted, parking-separated bike lane helped spark enthusiasm for green lanes in Memphis, the former ?worst city for cycling,? 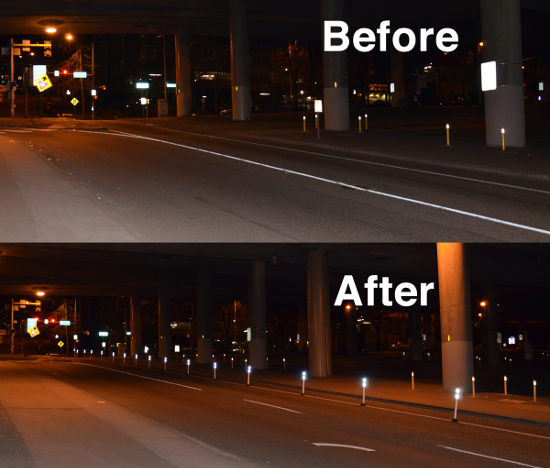 a do-it-yourself bollard project just inspired similar improvements in Seattle. Above, you can see what a group of anonymous safety activists calling themselves the Reasonably Polite Seattleites built in the dead of night last April. In their email to the city, they explained the merits of such a project and noted that it had cost them $350 and taken 10 minutes to install. The bollards had been affixed using an easily removable adhesive. Seattle DOT images of improvements on and near the former guerrilla project. 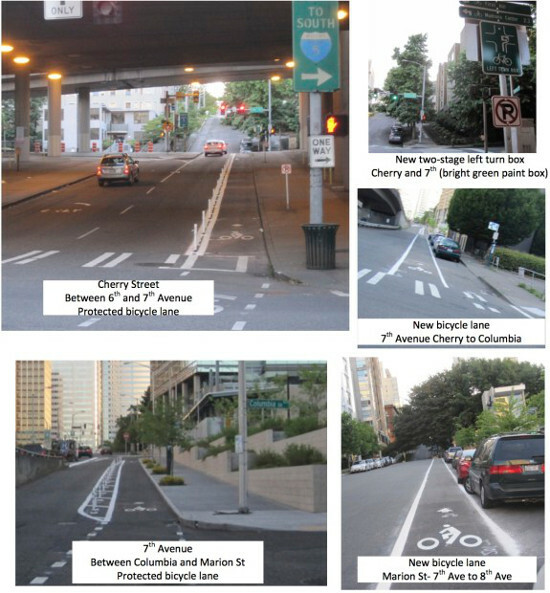 In a polite email to the Reasonably Polite Seattleites, city traffic engineer Dongho Chang wrote that his office had worked with the state department of transportation ?to reinstall your thoughtful protector treatment on Cherry Street. — We also took this unique opportunity to make additional improvements.? As SBB’s Tom Fucoloro notes, it’s always nice to see a city acknowledge that good transportation ideas can come from anywhere.